Fujifilm has two versions of the their 56mm lens, the regular Fujinon XF 56mm f/1.2R and the Fujinon XF 56mm f/1.2R APD, one that has an internal apodization (APD) filter. Before I get into the technical lens details, let me mention that you'll see a number of animated GIFs in this blog posting that are comparisons between those two lenses wide open at f/1.2. Note that GIFs only have 256 colours in total and are dithered to allow them to display a 24-bit colour image. This dithering can be visible as some roughness or even slight banding in these animations. Also, for those who just want to dive in and look at images, here is a link to the full gallery with all the photos mentioned in this posting, each carefully shot at seven different f-stops with both lenses - 70 images in total! I chose to test the lenses at third-stops from f/1.2 to f/2 and then go right to f/2.8 and finally f/4 since the effect becomes so minimal once you stop down past f/2.0. The photos in the sample gallery were all shot on a tripod, with the two 56mm lenses changed carefully as to not move the camera. For some reason, I did notice a hint of movement on some sets that was likely my forgetting to sufficiently tighten the panning-lock on my ball-head, however, there was definitely a distinctly different "aim" to both 56mm lenses, something I found a bit unusual. Even though the shift was only slight, it was bothersome enough that on all the photo groups, I carefully cropped them ever so slightly, then nudged the crop frames around until I got the best superposition of the regular set with the APD set. While this was rather tedious, luckily Lightroom made it fairly painless. Once I had the f/1.2 versions aligned, I could just sync the crop settings on each group of smaller f-stops. In order to show some of the bokeh effects more obviously, I heavily cropped two sets in the gallery, namely photos 15-28 and 57-70. On those, the frame you see is roughly a third the area of the whole field-of-view. All the others only have a tiny bit of cropping, just enough so I could achieve perfect alignment of each set of shots, well almost perfect at least. Lastly, there was some movement of branches due to wind, especially in photos 43-56. Above, you can see the regular 56mm on the left and the APD version on the right. Basically, Fujifilm has inserted a radial, graduated neutral-density filter inside, into the optical path of the lens. The outside edge of this circular ND filter is darkest and it feathers to clear, maybe a 1/2 of the way towards the centre. As you can imagine, as the lens' aperture closes down towards the clear area, the effect becomes less and less. In fact, by f/5.6 Fujifilm states that there is no more difference between the regular 56mm and the 56mm APD, so at this point the aperture at f/5.6 is fully clear. Despite how the photo above looks, the center of the APD is, in this image, a little brighter in fact than the centre of the regular lens - an optical illusion! Okay... but what does this filter actually do in practice? They key reason to have this inbuilt APD filter is so that when you are shooting wide open, or close to it, the darker edge of this filter serves to smooth out (darken) the edges of out-of-focus (OOF) "blobs" in your images... let's call them "bokeh balls" from now on. For example, if you have a small OOF light behind your subject, it will generally render as a circular disc and with the regular 56mm, this disc will have a slight outline and/or a fairly hard, abrupt edge, depending on the f-stop. When you have lots of overlapping bokeh balls, each with a hard edge or a slight outline, what happens is that you get "nervous bokeh" which can be visually distracting, drawing attention from your intended subject. The APD filter ingeniously serves to smooth out the edges of these bokeh balls and reduces the nervousness of background (or foreground) OOF areas. Notice how the cluster of blue Christmas lights in the center of the frame below (one of the more heavily cropped images), have a lot of distracting ringed edges on the regular 56mm, but with the APD, they blend more into a smooth clump without as many outlines? Of course, you might look at my image gallery with the photos of Nicole and see all those big bokeh balls everywhere and still be very distracted! Of course, I intentionally shot most of those photos in such a way to include lots of OOF light sources right near my subject, since I was trying to demonstrate how that lens renders in those situations. You may also notice a few more things. One is that the bokeh balls are smaller on the APD, even though both lenses were shot at f/1.2. Well, the 56mm APD does not behave quite like a genuine f/1.2 lens. The APD element acts sort of like a "soft" aperture stop and not only does it let in less light at apertures wider than f/5.6, it also serves to increase the apparent depth of field (DOF). It also helps essentially eliminate the slight bit of vignetting that the regular 56mm exhibits when wide open. As you stop the lens down towards f/5.6, this effect becomes less and less. At f/1.2 the APD behaves more or less like an f/1.7 lens, at f/1.4 like an f/1.8, at f/2 an f/2.3, f/2.8 an f/3.0, f/4 an f/4.2 and once you hit f/5.6, the light loss and DOF increase is totally gone. This is marked as such on the 56mm APD's aperture ring in orange so you can see the effective working aperture, although your photo's metadata will only tell you the non-APD-compensated f-stop. The second thing you might note, especially when examining the higher resolution versions of certain images, is some unevenness in the bokeh balls, especially those made by small, point light sources like those OOF Christmas lights in the centre of the "APD-f1.2-lights2" shot above. There are a few small dark spots visible in the bokeh balls of the APD version, and that was actually due to some larger dust specks on the front or rear elements of the lens - not sure which since both needed cleaning. Oops. However mainly I'm referring to the concentric inner rings you can see on the bokeh balls (with both lenses), sometimes known as "onion ring" bokeh. 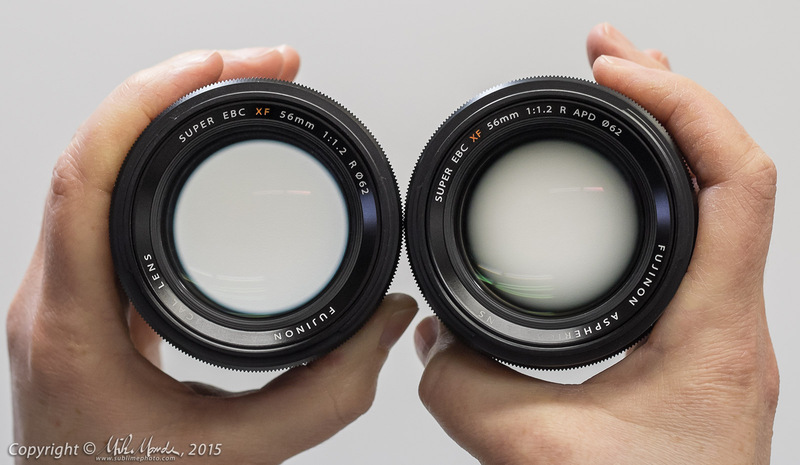 This is likely due to imperfections in the moulds that are used to cast the aspherical lens element that both 56mm lenses have, and those imperfections are probably caused by the manufacturing technique employed when fabricating such moulds. There is a good article on what probably causes this effect on the imaging-resource website. Luckily, this only really seems to be an issue with OOF point light sources at night, not something that most will probably run into all that much. With larger, more diffuse light sources at night or just general, lower contrast OOF areas, you cannot see this onion-ring issue at all. Note that Fujifilm wasn't the first lens manufacturer to use an apodization filter: Minolta released their 135mm f/2.8 STF back in 1999, with STF standing for Smooth Transition Focus, or just Smooth Trans Focus. When Minolta shut down and Sony took over their camera operations in 2006, Sony rereleased this lens under their own Alpha mount label. Note that while Fujifilm's APD filter only gives just over a 2/3 stop of light loss wide open, the Minolta/Sony 135mm STF lens loses 1.5 stops, so instead of f/2.8 it effectively becomes an f/4.5 lens as far as light transmission. Also, the 135mm STF is strictly manual focus, whereas the Fujifilm is still an AF lens, albeit with one limitation I'll mention below. Due to the stronger apodization filter that the 135mm STF employs, I would also guess that it has a much more dramatic effect on bokeh smoothing. While Beau Photo rentals has a Sony 135mm STF, I did not have a chance to carefully shoot any side-by-side samples. With significantly differing equivalent focal lengths, this wouldn't really have been possible in a meaningful way either. 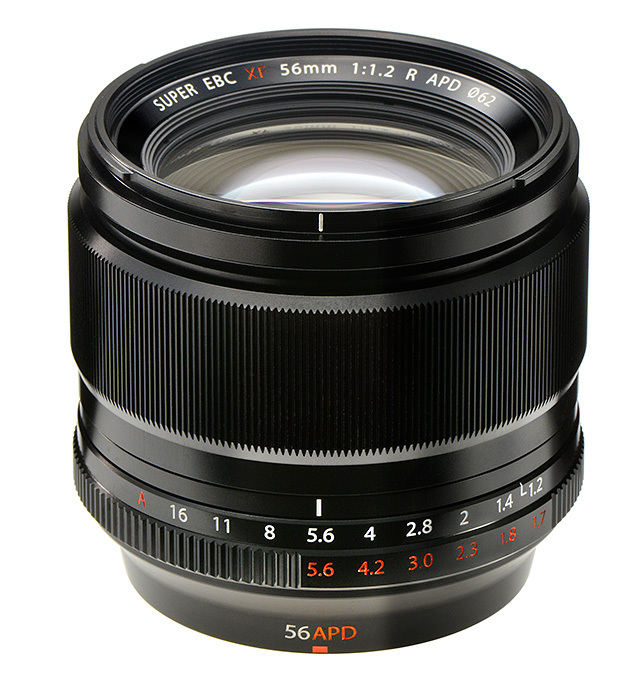 So, what is the focus limitation I speak of with Fujifilm's 56mm APD? Well, while you retain contrast-detect AF with all Fujifilm X-series bodies, you lose the faster phase-detect AF on the X-E2 as well as the X-T1 and on future bodies too I imagine. Oversimplifying here, since phase-detect AF looks at light rays entering the lens from widely-spaced angles, the apodization filter could interfere with this and Fujifilm decided to only enable contrast-detect AF with the 56mm APD. Personally, I have no issue with that since contrast-detect, while a little slower than phase-detect, seems to actually be slightly more reliable for static subjects shot at wide open apertures, something you are likely to be doing a lot with this lens! You might be wondering why Fujifilm needs to use an APD filter... can't they just make a normal portrait lens with really nice, creamy smooth bokeh? Well usually smooth bokeh and tack-sharp wide-open performance do not go hand in hand. Lens designs are often compromises: make a lens that is super sharp wide-open with great micro-contrast, and you might find that it has terribly nervous background bokeh. Design a lens with beautiful, buttery smooth bokeh and you might find that it suffers from low-contrast and a general lack of sharpness at wider open f-stops. Using an APD filter is an attempt to get the best of both worlds: a lens that is razor sharp with great contrast, even wide open, but one that also has nice smooth bokeh as well. While the XF 56mm f/1.2R APD is not perfect (one could hope for an even stronger background smoothing effect), it certainly seems to offer one of the best blends of performance that I have seen for a fast f-stop, short portrait lens, without incurring too much effective light loss from the APD element. The smoothing seems strongest near the centre and falls off near the edges of the frame. Bokeh balls are smoothest along their inward facing edges and show more outlining away towards the edges of the frame. An interesting optical effect from the filter I presume? Much beyond f/2.0, the APD effect is so subtle as to be nearly invisible except with careful side-by-side viewing. By f/5.6, there is absolutely no difference between the two lenses as far as image quality is concerned. The optimal f-stop to shoot for the smoothest bokeh seems to be f/1.4. Even the APD version shows a tiny bit of outlining at f/1.2 but by f/1.4, this seems to be minimized while having virtually no effect on DOF and thus the degree of OOF blur. Depth of field is greater in the APD effect f-stop zone than with the regular 56mm. Since DOF is greater, bokeh balls are a bit smaller (but smoother) in the APD zone as well. Some onion-ring bokeh can be visible with OOF point light-sources - on both versions. Virtually no chromatic aberration and minimal bokeh fringing on either 56mm, something that often afflicts fast, short primes. I didn't notice any purple fringing on high contrast edges either. The degree of obviousness of the APD effect varies greatly from image to image, dependant on your subject distance, the distance of OOF elements in front of or behind your point of focus, and even how much contrast those background or foreground elements have. You're not always going to get a "wow" effect with the APD, even when shooting wide open. Well, at least not much more of a "wow" than even the regular 56mm can give you! Sharpness and micro-contrast actually seem slightly better at wide apertures on the APD, but this is also likely caused by the slight stop-down effect of the APD filter. Both versions are truly incredibly sharp for any subject matter you want to shoot. Since there is up to a 2/3 or so stop loss of light wide open, you may be dealing with slower shutter speeds with the APD version in difficult lighting. No phase-detect AF, so focusing can be a little slower than the regular 56mm at times. I had no opportunity to shoot in the sun the whole time I had both 56mm lenses so I really don't know how they perform for flare or if the APD is any better or worse in that regard either. With both the 11mm and 16mm macro extension tubes mounted, both 56mm lenses can offer roughly a 1/2 life-size (1:2) macro magnification, so if you do more portrait work and only the occasional macro, then it makes sense to get either 56mm lens (plus tubes) over the 60mm f/2.4 macro. That said, if you do more macro work and only portraits once in a while, the 60mm f/2.4 actually offers great performance wide open and very smooth bokeh too, making it a viable portrait lens as well in my opinion. As good as the 56mm APD lens is for portrait work and for getting the smoothest bokeh, the regular 56mm f/1.2 is a truly stellar performer as well! At the moment, you'll pay a whopping $500 more for the APD version of the 56mm f/1.2. So... is the 56mm APD really worth $500 more than the regular one? I would say that if you are a portrait shooter that likes to shoot wide open as often as possible, to get that certain look, then you may find the APD version to have appeal in many situations, perhaps giving you a slight edge with a subtly different look over those using regular portrait lenses. However, if you tend to shoot your portraits at f/2.8, f/4 or beyond, then I'd simply say this lens is very likely not worth the extra money for you. This is definitely a connoisseur's lens, very much a niche product. Remember to check out the two image galleries mentioned at the start of this blog entry and hopefully you've found this detailed comparison both interesting and helpful!